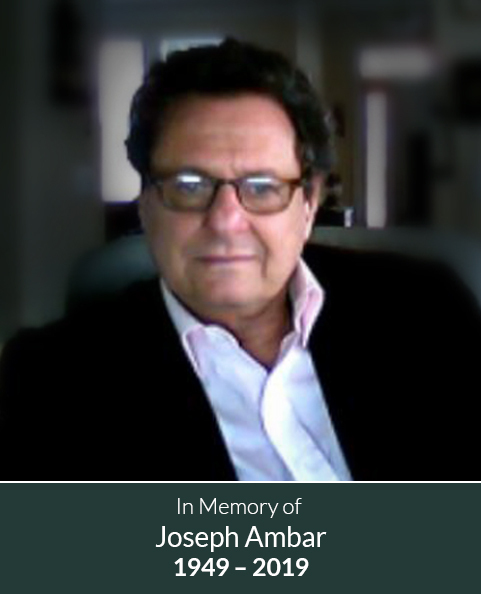 With a heavy heart, we inform you that Joseph Ambar, our President of International Sales, and of Raleigh, North Carolina USA passed away peacefully at home, following a short battle with cancer on Saturday, 2nd February surrounded by his family. He was 70 years old. He is survived by his wife of 46 years Hana, his two sons Jonathan and Danny, and his extended family. Joe / Yossi, was a very valued member of our company. Our family has worked closely with Joe since 2004, when he helped us to set up our first jewellery company in Sydney. He was an integral part of establishing Moissanite International. Joe was a global citizen, who was extremely talented in multiple languages. Together with his charisma, deep knowledge of the jewellery industry and integrity, he was able to develop wonderful relationships with clients all over the world. A true gentleman always, Joe was a very good man and our dear friend. Joe will be greatly missed by our family, all members of our companies, our clients and suppliers. Our prayers are with his family at this time. The funeral will be held graveside on Tuesday, February 5 at Raleigh Hebrew Cemetery, 450 N. State Street in downtown Raleigh at 3 o’clock.